Audible Alarm, AVR (Automatic Voltage Regulation), Cold Start, LED Display, Rack Mountable, Surge Protection. 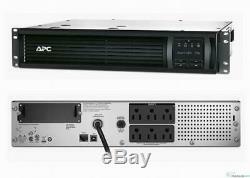 APC SMT1000RM2U Smart-UPS 2U Rack mount Power Battery Backup 1000VA 700W 120V LCD. 700 Watts / 1000 VA. 50/60 Hz +/- 3 Hz (auto sensing). 6 feet 1.83 meters. Bulky items over 150 lbs. International Customers - contact me. The item "APC SMT1000RM2U SMART-UPS POWER BACKUP 1000VA 700W 120V RACK 2U SUA1000RM2U" is in sale since Thursday, February 21, 2019.